With nearly 120 million TV owning households, watching an average of 5 hours of TV a day, there’s little doubt that we love our TVs. And if you’re like most people, that beautiful flat screen is sitting on a table or stand in your living room or bedroom. But there are a number of reasons why wall mounting your TV would make a lot more sense. And if you’ve been putting it off, because you are intimidated by the installation process, check out ECHOGEAR.com to see how easy it is to find and install a TV wall mount that will work for you. Need convincing? Here are six of the best reasons to consider getting your TV off the table and onto the wall. 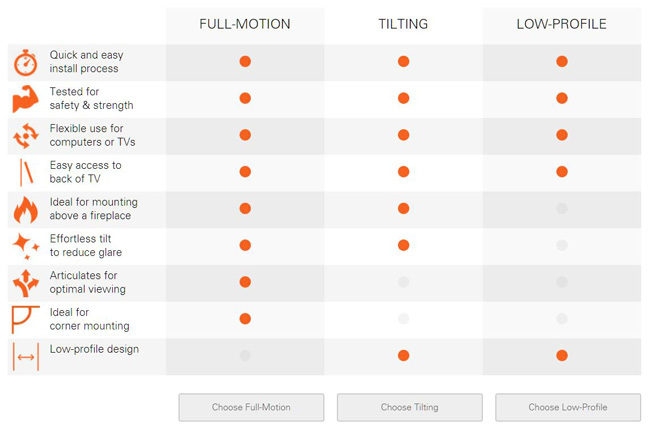 Choosing a wall mount with both side-to-side and titling allows you to optimally position your TV to reduce reflections from lights and windows. And as light changes throughout the day, simply adjust the TV angle. Mounting your flatscreen TV to the wall will give your home a more modern, upgraded design appearance. And there are numerous options for reducing your cable clutter that will give a cleaner, less cluttered look to your room. If your one-inch wide flatscreen TV is sitting on an 18-inch wide table or stand, you’re wasting a lot of your precious living room real estate. And in a bedroom or small office, where space is at a premium, a TV wall mount may be the only thing that makes a flatscreen TV a viable option. TV tip-overs can be a serious risk in your home, especially if you have small children or pets. Mounting your TV to the wall eliminates this danger, giving you additional peace of mind. And all ECHOGEAR mounts are UL listed, meaning they can withstand the hustle and bustle in your home and they are tested with up to 4x the rated weight limit. ECHOGEAR’s website breaks down the installation process into 3 easy steps. 1) Attach TV brackets to your TV. 2) Install the wall plate. 3) Hang your TV. You’ll need a few tools to install the wall plate, but it isn’t rocket science - you got this! And even if you do run into trouble, ECHOGEAR has a US-based customer care team on call 7 days a week to help you out! Wall mounting your TV is surprisingly inexpensive. ECHOGEAR wall mounts start at only $25, and include all the hardware you need for mounting to your wall. ECHOGEAR also has add-ons for mounting your soundbar and video streaming devices. And Techlicious has solutions for hiding your video cables – no drilling required! Ready to get started? ECHOGEAR’s Mountfinder tool makes it simple to find the perfect mount for your exact TV model and design placement. Visit ECHOGEAR.com to see their full range of TV mounts, AV cables and accessories that will make your home more beautiful and let you get the most from your flatscreen TV. And follow ECHOGEAR on Facebook and Twitter for more helpful tips (and a little humor!). This is a sponsored conversation written on behalf of ECHOGEAR.